As the sun rises over the murky waters of the Port of Los Angeles, we set off in our diving boat for a day of chasing microbes. 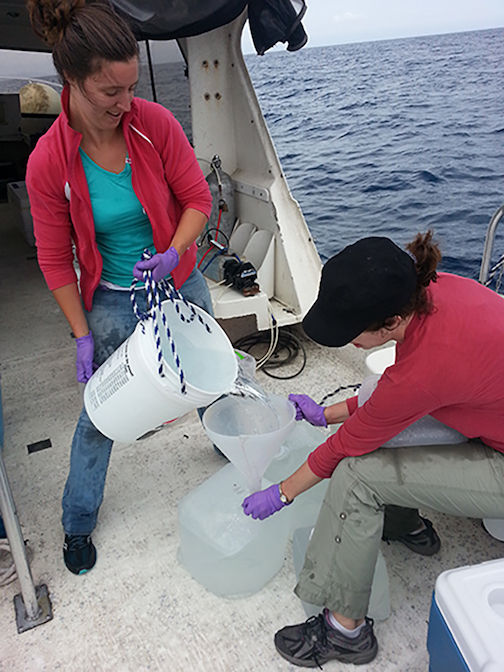 Lab managers Erin Fichot and Catherine Roney-Garcia flex their muscles and prepare for hauling about 200 liters of seawater onto and around the boat. 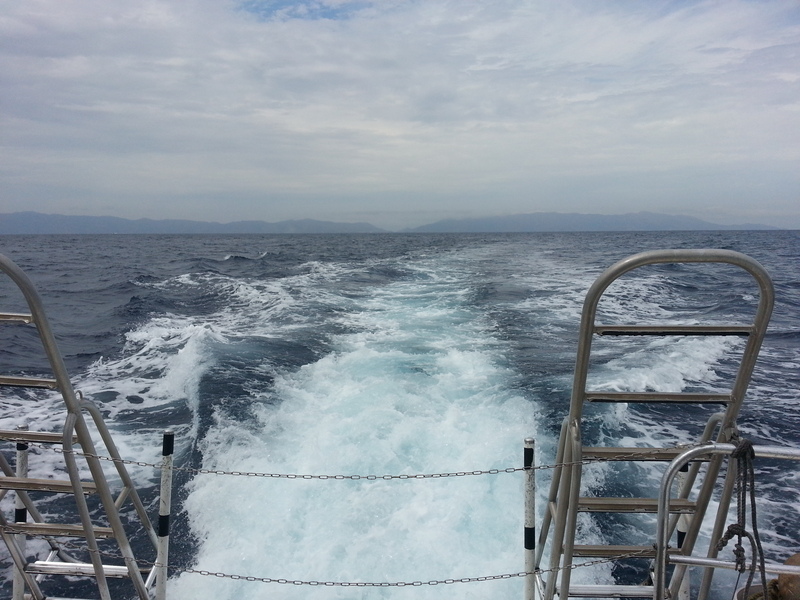 We steam across the San Pedro Channel towards the beautiful Santa Catalina Island. Stopping shortly to collect water at the entrance to the Port of Two Harbors, we turn back and sail towards Los Angeles. By 11 am we reach our second stop in the middle of the channel. This is the San Pedro Ocean Time-series, or SPOT, which has served as a monthly microbial observatory for the past 20 years. The water here is clear almost year-round except for the occasional spring algal bloom. By now I am already filtering the collected water to separate free-living bacteria from larger eukaryotes or particles and smaller viruses. Occasionally we look up from our bench to watch dolphins playfully frolic in the boat’s wake until we reach our last sampling location and point of origin – the Port of Los Angeles. Many of the bacteria we collected are infected with bacterial viruses, aka phages. To learn about those phages, we used a basic concept of the viral life cycle: phages with DNA genomes only transcribe mRNA when infecting a host. This mRNA often looks like that of a bacterial operon, as it is long and contains multiple genes. We extracted RNA from our marine bacteria, sequenced metatranscriptomes, assembled them and searched for long contiguous pieces (contigs) with viral signatures such as hallmark genes (Roux et al., 2015) or nucleotide frequency (Ren et al., 2017). These contigs represent partial or full genomes of phages that were actively infecting bacteria. Mapping short reads back to those contigs and to known phage genomes that we expected to find revealed interesting seasonal and location-specific dynamics. Photosynthetic cyanobacteria are very common in the San Pedro Channel. Their supply of energy and carbon depends solely on the function of light-harvesting photosystems. However, during phage infection the bacterial protein synthesis shuts down and the fragile photosystem-II protein D1 is the first to break. Some phages that infect cyanobacteria use an ingenious life-support mechanism. They carry the gene psbA which codes for PS-II D1 so that it is transcribed and translated along with the phage genome almost from the beginning of the infection process (Lindell et al., 2005, Clokie et al., 2006). This way, the host photosystem continues to harvest solar energy right until the cell lyses so that the phages can complete their replication and assembly. Previous studies found viruses carrying genomic psbA in various ocean regimes (Sharon et al., 2007). We found that the viral form of psbA is very highly expressed, and in fact, in all metatranscriptomes its expression was comparable to that of the host form. Perhaps psbA is overexpressed in infected cells. Perhaps it is not, which would mean that half of the cyanobacteria are infected with a phage at any given time. Cyanobacteria produce ¼ of the global oxygen production. Are viruses actually driving half of that? Roux, S., Enault, F., Hurwitz, B. L. & Sullivan, M. B. VirSorter: mining viral signal from microbial genomic data. PeerJ3, e985 (2015). Ren, J., Ahlgren, N. A., Lu, Y. Y., Fuhrman, J. A. & Sun, F. VirFinder: a novel k-mer based tool for identifying viral sequences from assembled metagenomic data. Microbiome5, 69 (2017). Lindell, D., Jaffe, J. D., Johnson, Z. I., Church, G. M. & Chisholm, S. W. Photosynthesis genes in marine viruses yield proteins during host infection. Nature438, 86–89 (2005). Clokie, M. R. J. et al.Transcription of a ‘photosynthetic’ T4-type phage during infection of a marine cyanobacterium. Environ. Microbiol.8, 827–835 (2006). Sharon, I. et al.Viral photosynthetic reaction center genes and transcripts in the marine environment. ISME J.1, 492–501 (2007).